So over the weekend I was in Glasgow, which was fantastic. The trip was a mix of partying, seeing friends, seeing Deadpool and seeing Glasgow. A lovely trip away! We were really lucky with the weather on the Sunday when we went to Kelvingrove Art Gallery and Museum. There was even some Scottish sunshine to be seen! It made the Kelvingrove building look even more stunning with the red brick against the backdrop of a beautiful blue sky. It really reminded me of the Rijksmuseum in Amsterdam – oh to go back there! 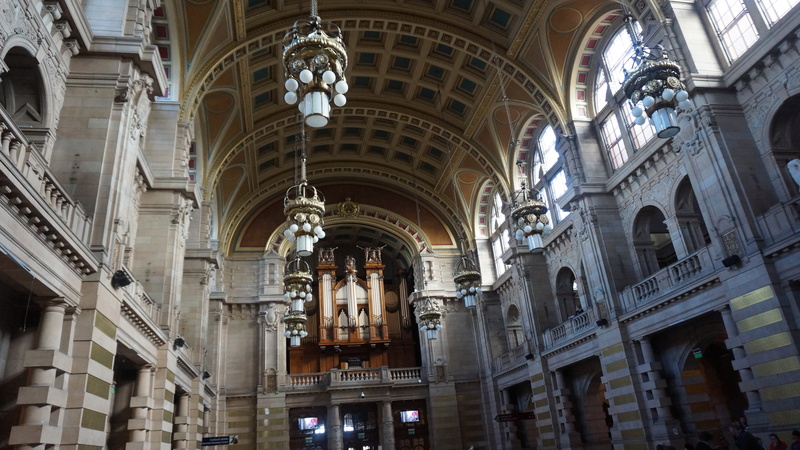 The architecture of Kelvingrove could not have been more intricate and visually captivating. I couldn’t help but gasp as I walked in. The space and size of it all was incredible and the way the light fell through the windows only heightened my sense of awe. The building underwent a £27.9million refurbishment a few years back, as it has been in existence and open to the public as a Museum since 1901. So obviously a bit of an update was necessary and wow, what a good job they did! As well as being totally blown away by the building, I was also amazed by the breadth of items on display. There are 22 themed galleries with 8000 objects. The collections are extensive and a real mix ranging from Ancient Egypt, to Arms and Armour, to Scottish History and Archeology, to Charles Rennie Mackintosh and the Glasgow Style, to Scottish Art, to Dutch Masters including Van Gogh and Rembrandt – the list goes on forever! As well as art there was also music, with an organ recital at 3pm which reverberated through the entire space. As it was Valentines Day there were a lot of people there and it was such a beautiful moment when the organ began and everybody stopped. It was as if time stood still for a moment before people carried on drinking their tea of looking at the map of the floor plan. The music just silenced everyone, especially in that initial moment, as if a spell of amazement had been cast on us all. As if there wasn’t already enough to be seen, there was also this sculpture composed of floating heads with varying facial expressions hanging from the ceiling. Light was directed at the heads to make them change colour periodically. This added a sense of serene to what were in some cases very distressed countenances. Despite this is truly was a powerful piece that captured the attention of everyone. On the whole this was a brilliant way to spend a day, I would absolutely recommend it to anyone visiting or in Glasgow. If you want a good day of culture, look no further than Kelvingrove!